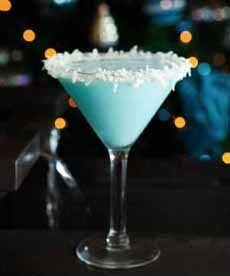  The Chanukah version of a Piña Colada (photo courtesy Weddings By The Breakers). 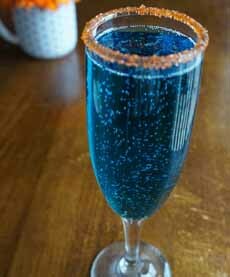 A champagne cocktail with blue curacao and a gold sugar rim. You can substitute edible gold glitter (photo courtesy Living-On-Cloud-Nine.com). Just as many of us “drink green” on St. Patrick’s Day, you don’t have to be Jewish to enjoy a blue cocktail on the first night of Chanukah (December 12, 2017; the date varies each year according to the Hebrew calendar). You can use any cocktail recipe with blue curaçao. Add a white accent and you have the colors of the Israeli flag. This cocktail recipe* (photo #1), from The Breakers in Palm Beach, is a riff on the Piña Colada, with orange flavor (from the curaçao) substituting for the pineapple juice. Here’s another blue Chanukah cocktail recipe without any coconut flavor. Want something elegant? Pour blue curaçao into a champagne flute, add sparkling wine. You can create a rim with sparkling sugar. 1. PREPARE the rim of the glass. Set down to shallow dishes: one for the agave, one for the coconut. Dip the rim of the glass into the dish of agave; then twist in the dish of coconut. 2. SHAKE the other ingredients with ice and strain into the glass. TIP: If you want to save calories, use coconut milk instead of Coco Lopez. More blue cocktails: Create a whole cocktail menu! *They didn’t intend it as a Chanukah cocktail, but as one matching the beautiful blue ocean around The Breakers. They call it the Coco Snowball.